I have a confession. Though it is true that I love to do tapestry crochet, and I love Corner to corner graphs, I am really really bad, or maybe it is really good at getting my yarn into a huge knot. Keep reading and I will tell you how I finally found the solution to the colorful mess that always accompanied my masterpieces. The solution: The Printable Yarn Bobbin. This project is part of my Woodland Winter Wonderland Blanket that consists of 6 squares and three rectangles of woodland critters all dressed up for a winter celebration. There are a lot of cute Corner to Corner Graphs available for free. Check them out below! Winter Fox, Big Brown Bear, Little Gray Rabbit, Shy Deer, Busy Beaver, Celebration Tree, Hedgehog and Song Bird. You can Pin all the graphs here for later! New to my blog? Check out my free pattern here or some of my favorites below. I am a mom and a blogger and this means I rarely get to spend a large amount of time on a project. My multi-color projects get picked up, shoved in a basket or bag and moved around. The end result is a big knotted mess. I have seen some beautiful wooden yarn bobbin contractions online for a price and a few DIY options. But honestly, I just do not have the spare time to build something. I needed a solution that was quick and easy and ready to use in minutes. That is when I designed the printable yarn bobbin! Keep on reading and I will show you what you need to make these printable bobbins, how to put them together, and how to use them so you can crochet and color change without the knotted mess. The Printable Yarn Bobbin PDF is a special gift to all my newsletter subscribers. Subscribe below to get access to my free printables page. After you subscribe you will receive a confirmation email and a welcome email that has a link and the password to my free printables page. That is it. There is two ways you can make these Bobbins so that they are sturdy and will last through multiple projects. First print out as many bobbins as you want. I recommend grabbing more than you think you need. Once I tried out these bobbins, I loved them so much that I refuse to pull from a skein of yarn. There are two sizes of bobbins available. I make a variety based on how much yarn I need of each color or how big my project is. You will want to add some extra stability to your bobbins by either laminating them or by using a glue stick or rubber cement to glue two pieces of card stock together. You will want to glue the extra yardstick on to your printed bobbins after they are printed and before you start cutting them out. Cut out your bobbins, punch a hole where indicated and move on to step 2. You may notice that the bottom of the bobbin is thinner than the top. This is because the photo is looking at the bobbin at an angle. If this bothers you just cut a little farther away from the lines on the bottom like I did in the photo below. If you chose the gluing option just jump to step three. a lot with crafting and making activities for my kids. Take you cut bobbins, place them in a laminating sheet and run it through a laminator. You will then need to cut them out again and punch another hole. (This hole is important). Once this is complete jump down to Step 3 to learn the secret to how these bobbins help keep your yarn from tangling. Step 3: One Simple Snip! Take you scissors and snip where indicated on the photo below. Now I know what you are thinking. This cut can’t be that important, but it really it. This little cut makes all the difference. With a flip of your wrist you can slip your yarn into the hole you have punched and keep your yarn from unraveling. Keep scrolling and I will show you. 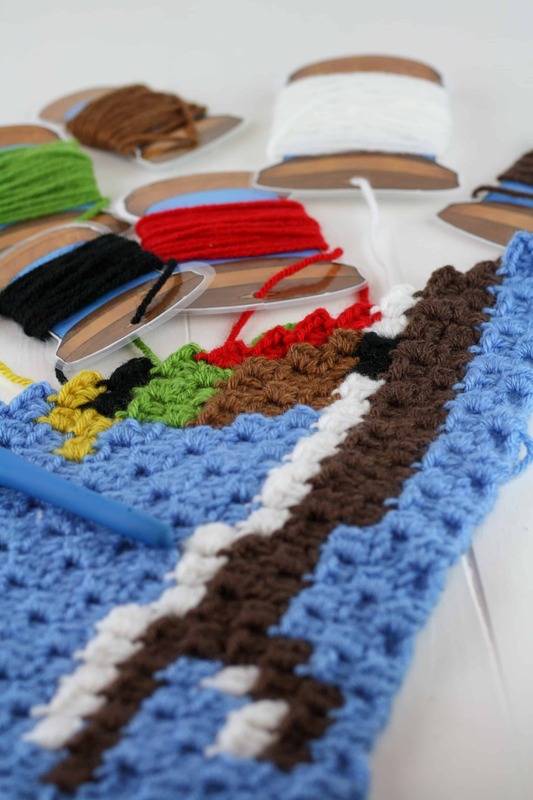 Now load your bobbins up with yarn and lets get to our crochet projects. You will be quite surprised how much yarn you can fit on one bobbin. While you are working on a project you will want all the strands of yarn tucked into the punched hole. Only have the color you are working with pulled out so that it can unravel when you pull on it. When you move to a new color tuck the yarn back through the slit we made and back into the punched hole. This will keep your yarn from unraveling. To keep from getting knots, only allow a few inches of slack between the bobbin and your project. When you are ready to set your project down for a while or you are going to toss it in a bag. Go back and double secure each bobbin so that it won’t unravel when stored. That is it! Wasn’t that a simple solution to a very stressful problem? I would love to see the projects you are working on and how you like your yarn bobbins! Come follow me on social media and lets be friends. Fill out the form below to receive access to the Printable Yarn Bobbin Pdfs. There are three sizes available. After you fill out the form, you will receive a confirmation email and a welcome email that has a link and the password to my free printables page. I hope you enjoyed the post. Want to be friends? Check the little box on the form below to join my email list and I will send you links to free patterns, crochet tips and inspiration straight to your email. Written pattern, tutorials, photos, graphs and pdfs are copyright Windingroadcrochet.com. Please do not reprint or repost this content as your own, but please feel free to share this link with others. You can find more information on sharing my work with others in the Terms and Conditions Page. I love Winding Road Patterns. Also the CAL C2C.